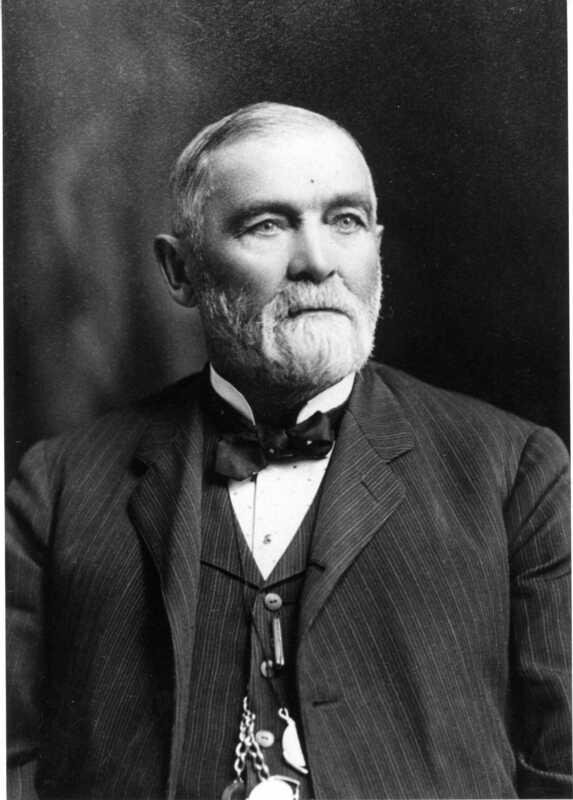 Edwin Ruthven Clapp (1827 – 1906) is my 2nd Great Grandfather. Today I spent some time with the E.R. Clapp family in Des Moines. Some of what follows I’ve written about before and some of it is new information to me. I’m trying to put it all together for myself and while I’m doing that, sharing it with you. We know quite a bit about Edwin Ruthven Clapp. He’s in some “Portrait and Biographical Dictionaries” and also actually published a biography of himself, a vanity publication, which I’ve not yet put my hands on. It’s a bit harder to find out about the rest of the family, but we’re making some progress. We certainly know in broad strokes about Edwin’s life. He was born in 1827 and in 1846 as a young man of 19 years of age, he came to Fort Des Moines, when it was not yet a city. During his life he had 6 children, two boys and four girls. He lost one of his boys and one of his daughters, who both died young. I don’t know the cause of their deaths, but Nellie died at age 2, Edwin died at age 5. So I suspect childhood disease, diptheria, rheumatic fever or the like. His son John died in 1886 at the age of 23, unmarried. His first wife, Emily Boughton, died in 1869. E.R. Clapp worked as a ferryman on the river as a young man in his 20s and when the river froze over, he cut and stored ice, later installing the first refrigerated ice making machine in the city. He bought a 1200 acre farm and was a farmer for a few years. by 1890 (likely quite a while before that, but he’s listed in a 1890 railroad directory that I have) he had become the “General Live Stock Agent” or “Stock Agent” for the Chicago Rock Island and Pacific Railway. In 1860 at age 33, he was Sergeant-at-Arms of the Iowa State Assembly. I believe he served for several years. He was very well connected politically in Des Moines and in Iowa. In 1873 he built “The Clapp Block” office building. In January of 1882, that building burned. He rebuilt. Edwin became a director of the Citizens National Bank and the State Savings Bank. He also became Vice President of the Century Savings Bank. So he was clearly a banker The Citizens National Bank had their offices in “The Clapp Block”. The “Edwin Clapp Shoe Company” made shoes (of course) and Edwin’s son-in-law William L. White had a shoe store and was the sole agent for Edwin Clapp shoes in Des Moines. The shoe store was located . . . in the Clapp Block, of course. EDWIN CLAPP Has for years had the reputation of making the best mens shoes ever made – in fact, the styles have always been made in advance by Edwin Clapp – – others imitate the styles — but they can’t imitate the quality and workmanship but that you can readily see it is an imitation — There is someting about a Clapp shoe that none of the other manufacturers can get. We are the exclusive selling agents of the Edwin Clapp shoe in Des Moines and have them n all the Clapp Styles, sizes and widths. W.L. WHITE THE SLEEPLESS SHOEMAN 506 Walnut Street, Des Moines. Parenthetically, when searching the internet for these ancestors, it is necessary to search on all combinations: Edwin Ruthven Clapp, E.R. Clapp, Ed. R Clapp, Edwin Clapp . . . etc. There may yet be formulations of their names that I have not yet puzzled out. Each search with a different name structure yields a little gem. Edwin built a fine house, which was, as he prospered, not grand enough. 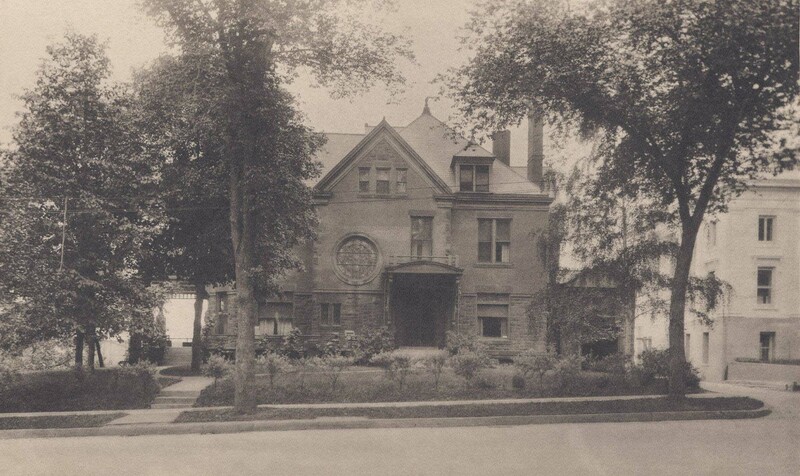 So he sold that and built this grand house at: 1900 Grand Ave, Des Moines. Grand in every way. If you look closely at the picture you’ll see it’s a fine house indeed. 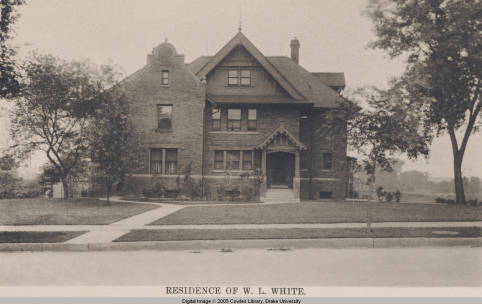 Upon his death, he gave the house to his daughter Ella Clapp White, who was married to the shoe salesman mentioned above. Edwin’s third living daughter Ida moved to Los Angeles before 1900, with her husband Lewis Conrad Smith. We’ll see more about Ida in a bit . . .
By 1930, Bertha Clapp Harbach and her husband L.E. Harbach had also move to Los Angeles and lived in Beverly Hills. Note that this is 30 years after E. R. Clapp’s first wife, Emily Boughton Clapp, died. It’s 28 years after he married Sarah Adelia Hackleman Mills. Sarah’s father, Pleasant Adam Hackleman and her first husband, Pleasant Jacob Mills, had both been killed in October of 1862, in the battle of Corinth. So Sarah had been a widow for 9 years before she married our ancestor, Edwin Ruthven Clapp. 28 years later she’s well entrenched in Des Moines society and hosts a visiting friend with a party. Note that her daughters “Mesdames Harry Elliott; Pleas Mills and L.E. Harbach” were present. Mrs Harry Elliott is Minnie Mills, daughter by her first husband, Pleasant Mills. Mrs. Pleasant Mills is her daughter-in-law Annie May Easton Mills, married to her son Pleasant Jacob Mills. Mrs. L.E. Harbach is Bertha Adelia Clapp, daughter of S.A. and E. R. Clapp. We have pictures of all three daughters. That’s an announcement that Ida Clapp Smith’s daughter, Nellie Smith, was married in Des Moines at her Grandfather’s house. A very nice house indeed for the bride, groom and half the wedding guests to travel from Los Angeles to Des Moines. On June 8, Edwin Ruthven Clapp Dies. I have attached his obituary, written by the author of his vanity biography, Tacitus Hussey, as a PDF file. In closing, just a bit of perspective. 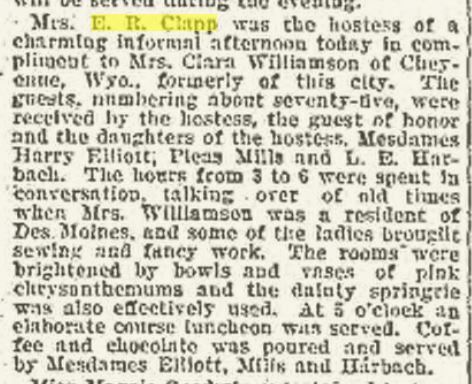 E. R. Clapp was a prominent citizen in Des Moines in the late 19th and early 20th centuries. He and his family were in the highest business and social circles in Des Moines. Newspaper articles about his business and family appeared all over Iowa (OK it was a juicy scandal), in the New York Times and the Los Angeles Herald. but here’s the bit of perspective: Des Moines in 1890 had a population of 50,000 people. It was, in fact, a very small city and our ancestor E.R. Clapp was a big fish in that small pond. I hope that those of you who may be following along as I learn about the family, are as interested as I am in these glimpses into their life. John Strong (1605-1699) – Two 10th Great Grandfathers on the same pilgrim ship!